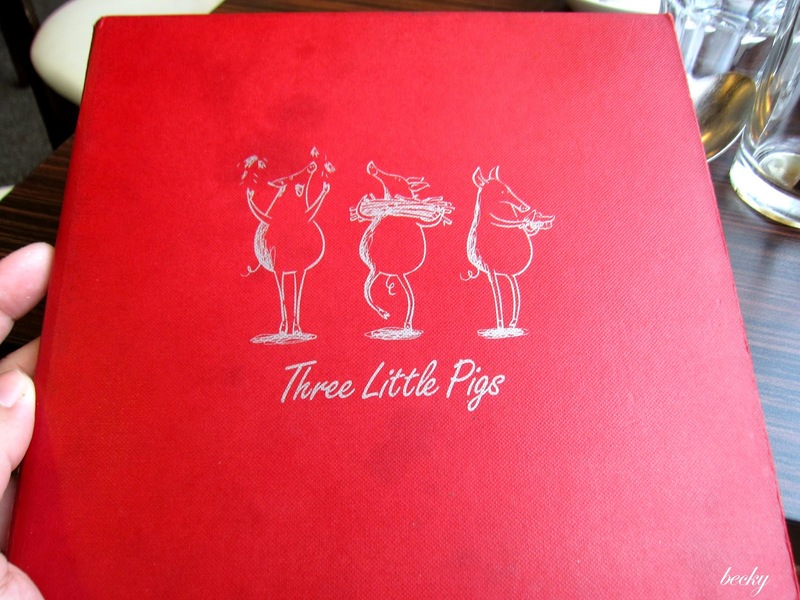 I'm sure most of you have heard the story about 3 little pigs and the big bad wolf - so are you the 3 little pigs? 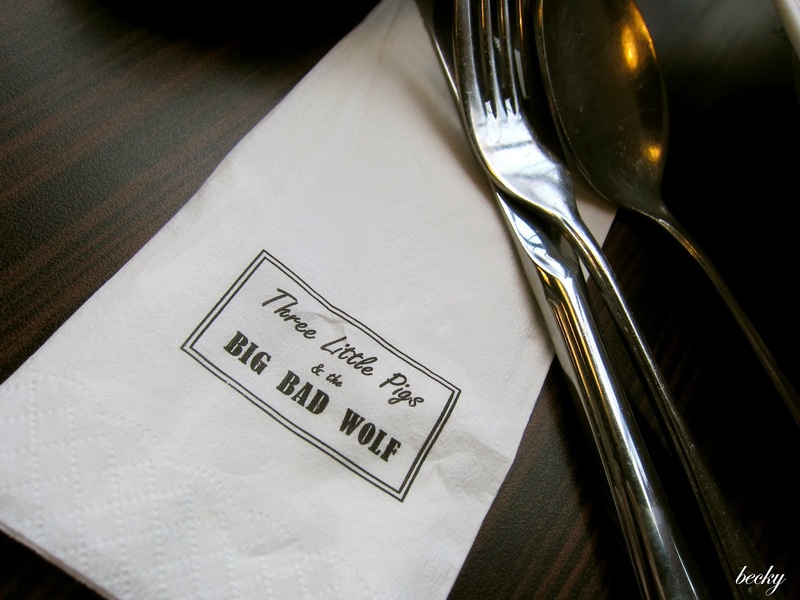 Or the big bad wolf? Fret not, this post is not about this children story. 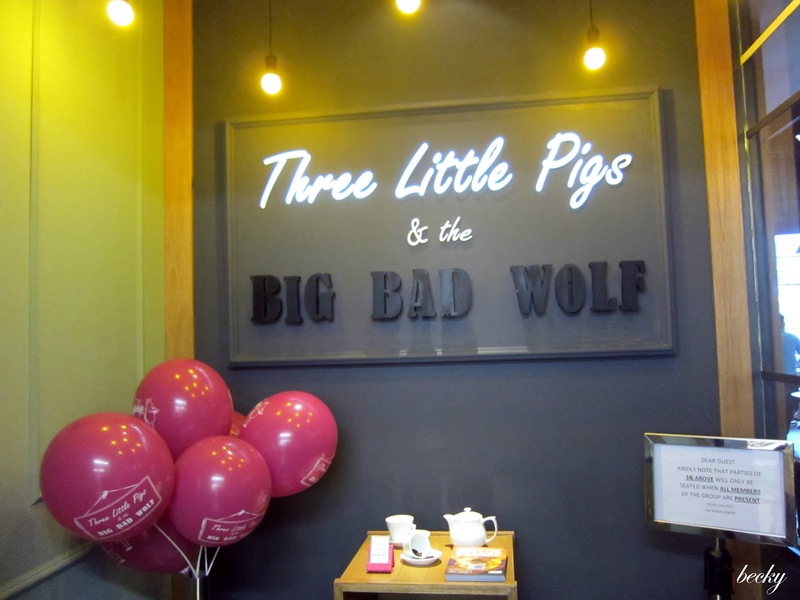 I'm talking about the Three Little Pigs & The Big Bad Wolf at Bangsar Village I. 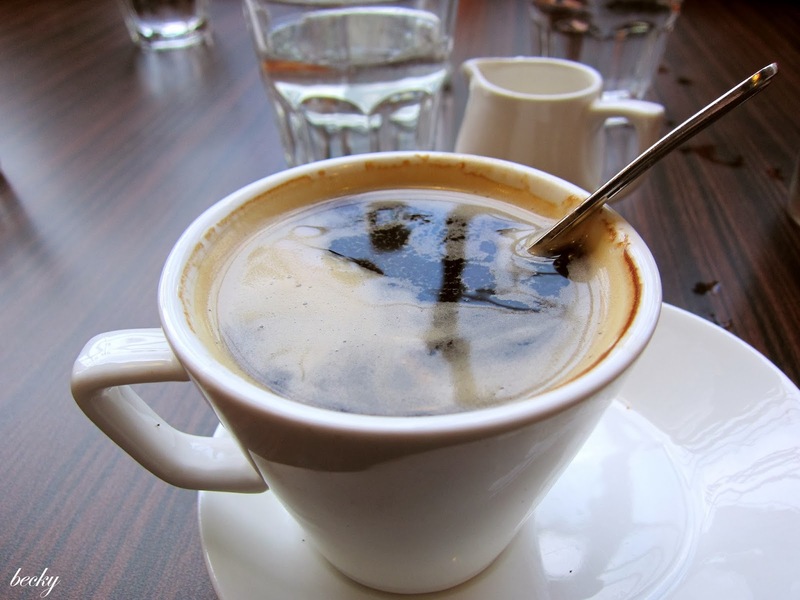 It is located inside the Village Grocer. 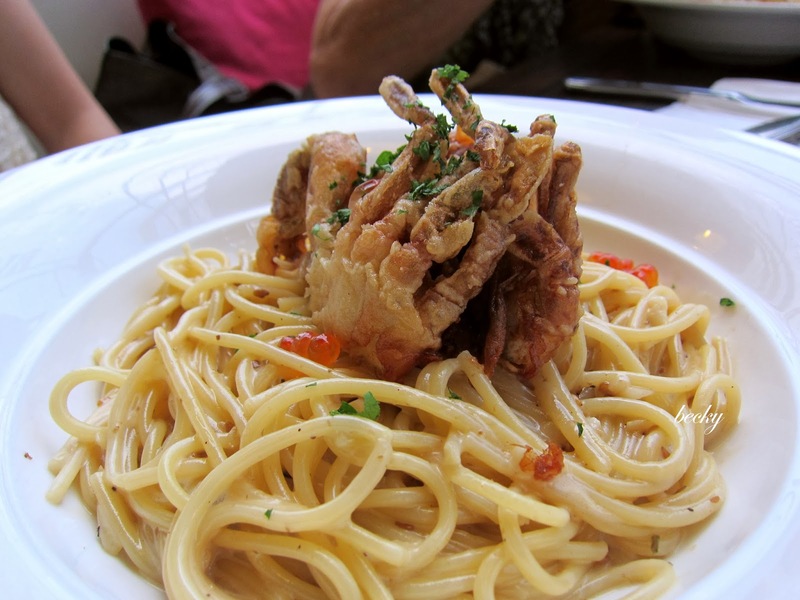 As the name suggested, they serve pork in almost every dishes on their menu. So if you are a pork lover, this is THE PLACE for you. However, if you are not that much of a pork lover, no worries! They do have non-pork options on the menu. 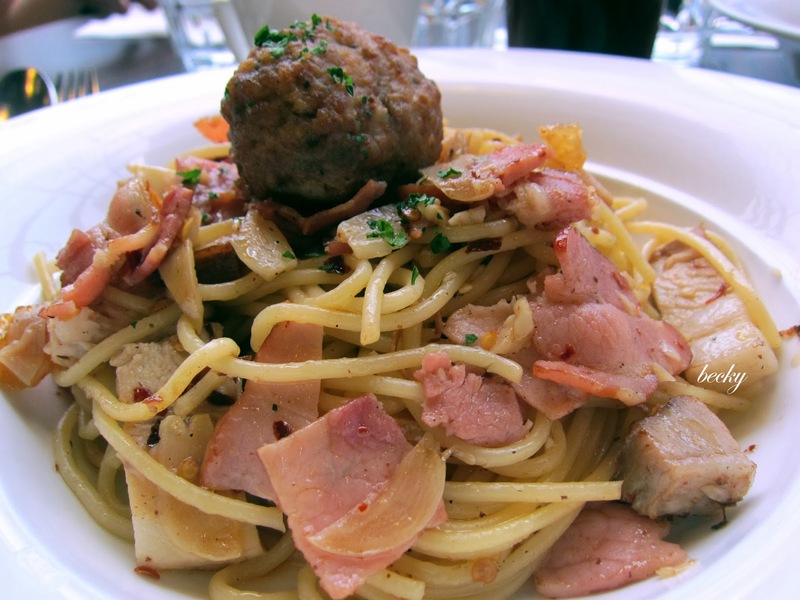 This is their signature dish - The Wolf's Favourite (RM29). 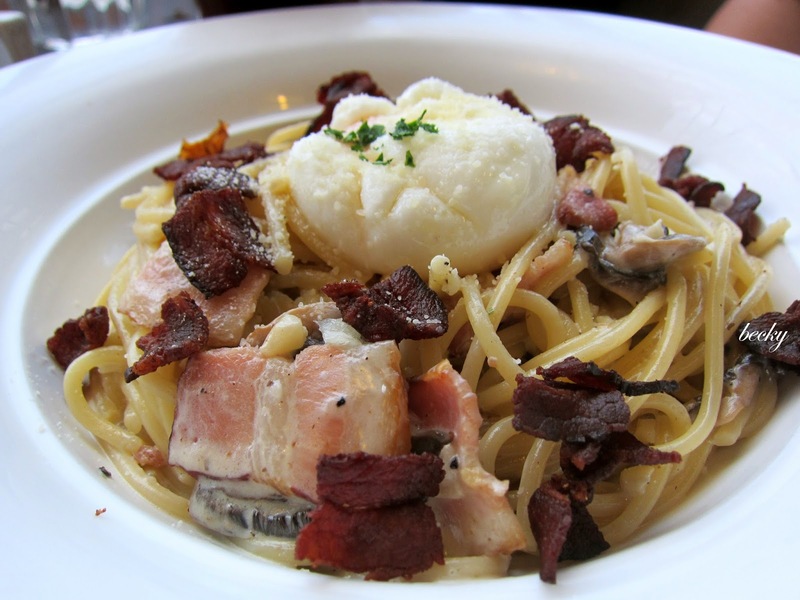 It is a carbonara with crispy bacons, some pork and top with a poached egg sprickled with some cheese. 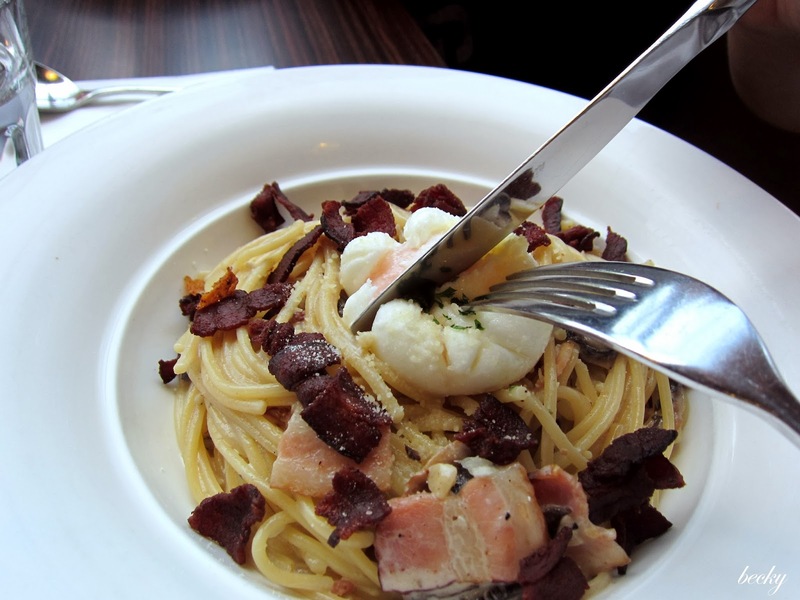 The carbonara was cheesy and creamy! 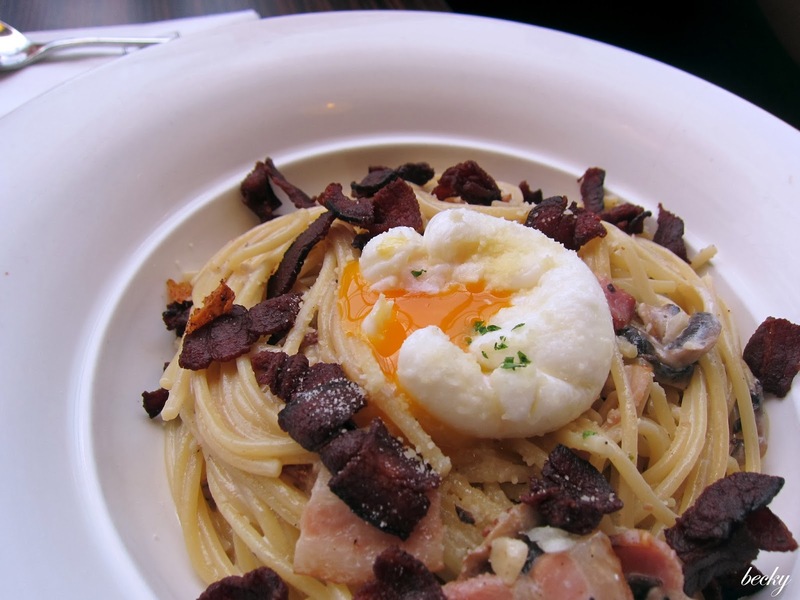 The bacons gave some texture to the dish and the runny egg added some creaminess to it. My cousin Liza ordered their breakfast and the portion is really huge - at least from a girl's point of view. 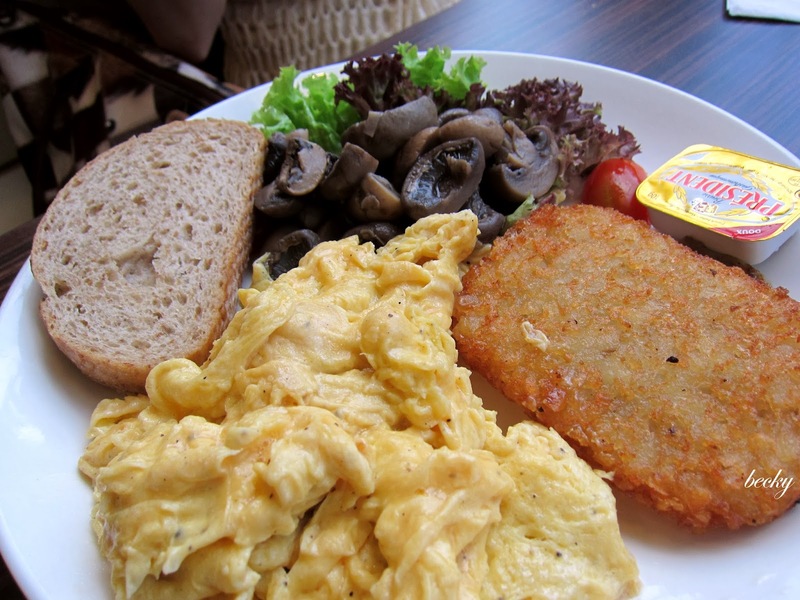 The scrambled eggs were nice and moist, the mushroom was sauteed to perfection (mind you, some restaurant just serve almost bland sauteed mushroom), the hashbrown was fried to crispy on the outside and moist on the inside. There is a pork patty (right underneath the hash), which was seasoned to perfection. 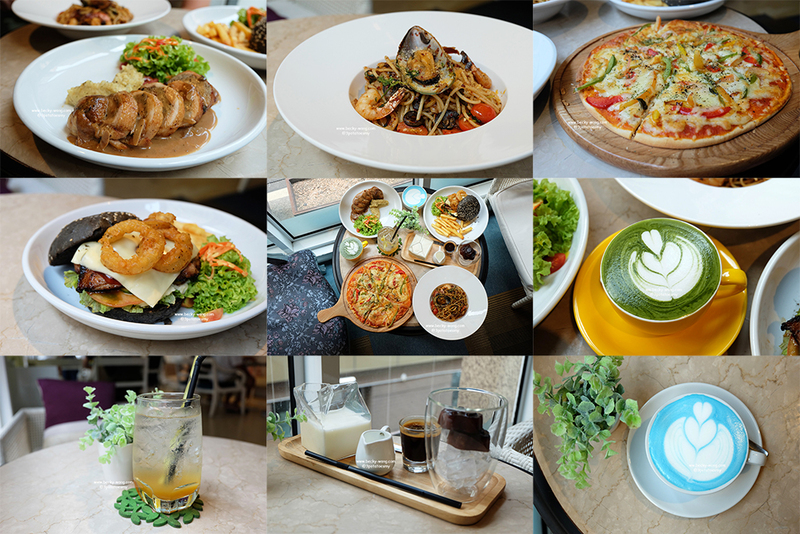 What is a meal without some mouth-watering dessert? The chocolate cake wasn't too sweet and I love the bananas in between the cake. 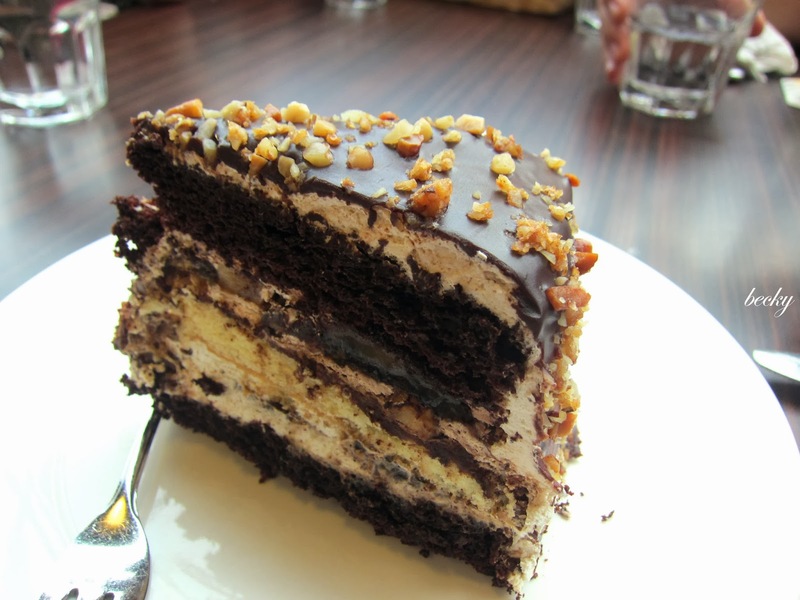 Besides that, the nuts gave the cake some nutty-flavor which was so addictive, I felt that personally! So...are you the little pigs that come out to play when the sun shine? Or the big bad wolf when the sun goes down? ** Their operation hours are Monday to Sunday, 9AM to 11 PM.